The tour will begin at Knott Landfill, the location for solid waste, composting and household hazardous waste collection. 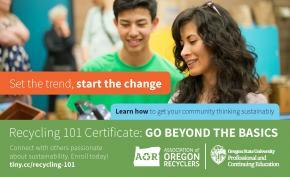 You’ll learn about the local landfill where all the solid waste from Deschutes County goes. In addition, see what materials residents can bring to the Household Hazardous Waste facility and how that is processed. Tour Deschutes Recycling compost facility where they take green and food waste to process it into three different compost products. The tour will end at the Environmental Center where their mission is to embed sustainability into daily life in Central Oregon. That means driving local change that makes a world of difference. See what they are doing with their learning garden, and other community outreach for waste reduction, reuse and recycling. Lunch will follow. Join us for this engaging and interactive tour of some of Bend’s most creative reuse entrepreneurs. We will tour homes build by Boxcar Productions in the NW Fresno sustainable Project which highlights sustainable building but also brings neighbors together in a healthy way. The Project is comprised of nine 50’x100’ lots and each home will be built with sustainable materials and landscaped with drought tolerant plants. From there we will visit DIYcave which functions like a health club but instead of exercise equipment, they have tools. We will tour their workshop space and learn about their innovative model of bringing skilled experts and tools to the everyday DIYer so they can bring to fruition all those creative and mundane projects. Bend’s Habitat for Humanity Restore will be our lunch stop. We will tour their facility which creatively embodies the Restore mission while also providing 100% of Bend Habitat’s operational costs! We will learn how the Restore has evolved in the building boom and bust of Central Oregon and learn more about their sponsorship of Rubbish Renewed Eco Fashion Show and their signature event, Furniture Flip.